This topic contains 43 replies, has 6 voices, and was last updated by Universal Head 1 year, 10 months ago. … namely, I bought into another FFG plastic fest. :O I tiptoed around the game for a while, watching lots of videos and reading the rules. I quite like the streamlined system and the fairly short playing time, and a friend mentioning he would like to play it with me finally pushed me over the edge. So I’m now stuck with 50 plastic minis wanting to be painted. Some are gorgeous, some less so. I quite like the Undead, but not so thrilled with the Humans – only their Golem mini is great. Cleaning and assembling the minis was okay (only the Undead bowmen were kind a fiddly), and I managed to paint the first big mini. Behold the Carrion Lancer! 1 down, 47 to go. And here’s the boss … Ardus Ix’Erebus. – I really don’t need yet another tabletop fantasy wargame. – I’m not overly excited by either the generic fantasy background or the figures. – I’m not enticed by a system that seems to have a lot of fiddly dials and tokens. – To get decent armies together will cost a fortune. – I’m concerned FFG will drop it if it doesn’t meet their fiscal projections. But I am interested in hearing your experiences with it, because I may be completely wrong. So please keep us posted! 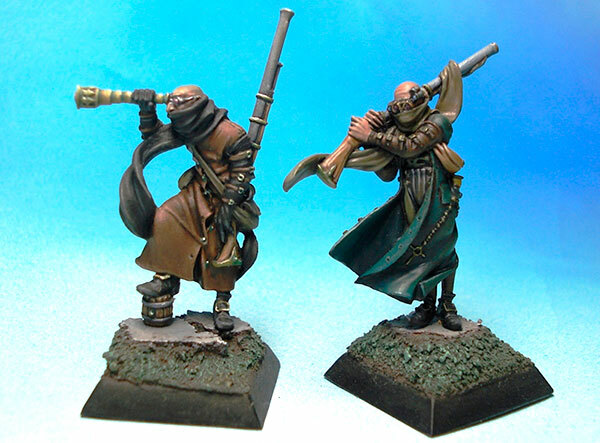 I am also tip-toeing around….because this game does something I always wanted in a tactical minis game. You do not now what your opponent will do in advance! I wrote in another forum some 18 months ago that my dreamgame would have something like the dial system from x-wing. And this one has it finally! In my oppinion “I do all of my actions with all of my stuff…then you do all your actions with all the stuff you have left over” is not an option. “I go – you go” and some “reaction based varients” are much better…but you still see clearly what and when your opponent is doing something….and can plan accordingly. With the dials you have to think hard and outthink your opponent much more…what do I commit to achieve a certain goal…because I do not know that I do not kill this unit with my unit last turn….I have to have a plan B or C if it fails…and so on…that has great impact on the game…if you fail it could ruin your plans…if you suceed it might win the game…so much more anticipation…and meaning…not only dice roles decide…you do…and with all that…ultimatly…I imagine…MORE FUN! Too expensive to get started. Initial factions were not interesting to me. Too expensive to get started (worth repeating). Expansions add little variation in miniatures and… you guessed… too expensive. And I’ve already spent a fortune on Hordes and Warmachine. Let’s start with my background and reasoning for getting the game … okay apart from the 90% blind, impulse driven lack of self-control. – I’m not generally a big tabletop player. I’ve always eyed the genre with longing and respect, but never really gotten into it. My most played miniatures game is probably X-Wing. As such I don’t have pre-existing armies that want to be played (fleets may be another matter though). – I don’t have a regular opponent who would paint and collect his own army. Therefore I need a game that can be used to play a quick skirmish out of the box. – Generic is good for me. I like the classics and would rather field an “Orc army from the Broken Plains” than the “Splatterers of Xz’kraargll the thrice-doomed Wurble of Kdsform”. That way I can better project my own imagination on these battles. – In general I don’t find the price point too bad. €90 gives me 48 minis and 2 (granted, small) armies that can be used to play skirmishes. Looking at Wrath of Kings, a “Battle of Ravenwood” starter box retails at $60, but gives me only 15 minis. Age of Sigmar is €100 for 47 minis. – I dislike the d6 orgies some of the GW games are. I looked closely at the GW Lord of the Rings game some time ago and really didn’t like the rules. Runewars seems to take a better approach with their custom dice, re-rolls and so on. – I love the flightpath system as used in X-Wing and prefer it over using measuring tape. So…is it actually your first build,paint,play TT game? If not…what did you play in the past? The very first contact (I think) was with Man O’War in the Nineties. A friend bought the box, didn’t really like it and gave it to me (yes, he’s a very generous person). The ship minis were too expensive for me back then, so I scratch-built lots of ships from paper and toothpicks and painted them. We played it quite a lot back then, and the minis still have a proud space in my display case, even though I don’t have anyone to play it with anymore. 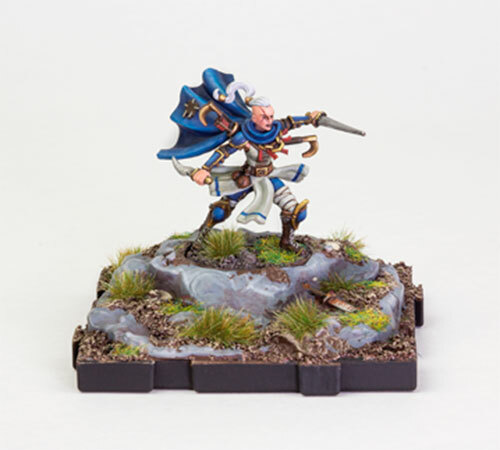 At the time I got generally interested in Warhammer Fantasy and bought a couple elf units, painted exactly one elven knight and then lost interest. I’ve occasionally watched a game at a convention or store event and been generally less then enthused with the rules and the play styles I saw. Worst example: Two guys take an hour to set up two huge (but mostly unpainted) armies. First turn, the one guy charges his big griffon-mounted hero center piece straight into the front line of his opponent. They roll dozens (or so it seemed at the time) d6s. Then the hero is dead, its owner is dismayed by his bad luck and concedes the game. Whaa? About ten years later I got interested in a German 15mm hex-based game, called Demonworld. I liked it because the 15mm scale allowed lovely big army units (and it had a classic, generic fantasy background). I bought a few orc units, painted one unit and some heroes, but couldn’t find anyone to play. I still have the makings of an army lying around unpainted. I think the models are awesomely detailed for their size, full of character. A long time of not painting any miniatures followed, until I got the War of the Ring and decided to paint all the pieces. That was much fun, but I longed for some better miniatures, so I bought some of the (then fresh) LotR line from Games Workshop – the early line was some of the best sculpting work I’ve ever seen, IHMO. Their Balrog is the largest mini I’ve ever painted. I checked out the accompanying rules and entertained giving them a try, but never really liked what I read. So Runewars is not my first rodeo, but one were the accessibility of the rules and manageable playtime promise to get my non-miniature-enthusiast friends to the table occasionally. I’ve just got all my Man o’ War figures back, so I’m hoping to film a battle report for it next time Will is here. Warhammer rules are terrible, IMHO. The long turns and the ridiculous amount of dice-chucking really show its age. The whole ‘roll to hit, roll to wound, roll to save’ process is very old-fashioned. Can I borrow Will for a couple months? He seems perfect to break out all those old games and play them with. You’ll get him back, honest. Onwards we paint… one fourth of the Reanimates unit done. It’s one of four sculpts, of course those will be mixed up in the trays when all are done. 6 down, 42 to go. This confirms for me something I noticed about the sculpts right at the start though (and it’s a personal preference): I don’t like the way they’re sculpting cloth. It’s blobby waves of thick ‘stuff’ going in all different directions rather than material with shape and direction that enhances the pose of the figure. Just lacks finesse IMHO.